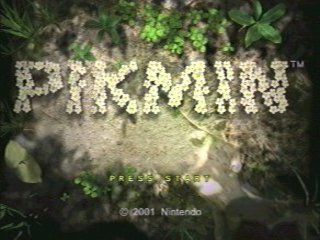 Released in December 2001, Pikmin is a unique real-time strategy type of game. Captain Olimar, no bigger than a quarter, has crash landed on a planet and in a month will die from oxygen poisoning. He finds strange creatures who grow in the ground and names them Pikmin, then calls upon them to help reassemble his broken space ship. Category note: 100% equals getting all 30 parts. Best Low%, Single-segment Time: 1:36:02 by Zack 'PiePusher11' Maher on 2014-10-18. Best 100%, Single-segment Time: 1:08:15 by 'MrDodiou' on 2014-09-05. First, I want to give a big shoutout to Dragorn. Without his segmented run of this category, this run probably wouldn't have happened. The majority of the route I used in this run is taken from his run, with some modifications here and there. "Low%" in Pikmin involves growing only 50 Pikmin throughout the entire run. The heaviest ship part, the Gluon Drive, takes 50 Pikmin to carry, so 50 is the minimum possible to beat the game. Day 1 - The tutorial day, nothing too interesting going on here. Interestingly enough, this is the day that saves the most time over the segmented run. In Dragorn's run, he takes the time to grow 25 Flower Pikmin, which I do not do in this run. Day 2 - On this day, I grow 9 Yellow Pikmin, collect the four parts that are (easily) accessible on Day 2, and knock down the gate by the Yellow Onion, which will help on Day 4. The Eternal Fuel Dynamo is not collected on this day, because I only have 34 Pikmin at this point in the run, and it takes 40 Pikmin to carry it. Day 3 - This day begins with growing 1 yellow and 14 blues. I don't grow all 15 blues right away, because the Breadbug comes while I'm growing blues, and it is much more convenient to send him to the red or yellow onion. The fifteenth blue is grown later on in the day. This day takes care of most of the parts that don't require a large number of blues, as well as knocking down a few key gates for getting parts back faster. Day 4 - Now that we have all 50 Pikmin grown, and all three colors, I return to the Forest of Hope, and finish the area completely. What happened with the Eternal Fuel Dynamo is, there's a text box that comes up when you get a certain radius away from every ship part. Also, when a part makes it back to the ship, scrolling through the text box is the game's cue to return to gameplay. So, I stand in a very specific spot, to bring up that text box on the exact frame the part gets back, and by doing that, it allows me to skip the cutscene. This has an interesting side-effect of muting certain sound effects, so that's why the game will sound weird for a while. The Snagret fight had some pretty bad luck, unfortunately, but at least no one died. Day 5 - This is probably the most technically challenging day of the run. The first big challenge is the Snitchbugs. They move around the map randomly, and I need to take both of them out before, or just after, fighting the Cannon Beetle. I actually got very good luck with them in this run, killing the first one very early on, and the second one just after the Cannon Beetle. In this day, since I will be needing 40 Blue Pikmin for various things throughout the run, I turn 24 reds and 1 yellow into blues. The way Candypop Buds work in this game, they immediately spit Pikmin back out if you throw exactly 10 in it, so it saves time to actually throw in 5 blues. This day also features the only glitch in the run. By getting the bulbear to bite you while at a certain height on the slope, it actually pushes you out of bounds, which allows you to collect the Chronos Reactor without needing to turn blues into yellows, and then back to blues. Day 6 - On this day, I finish up the Impact Site. There is just one part to collect here, and since it requires 20 blues to carry it, this is the earliest I could do this day. Day 7 - This day is fairly straightforward, I simply collect the remaining parts in the Distant Spring here. While I am collecting most of the parts with 30 Blue Pikmin, I use the remaining Pikmin to build the bridge to the Gluon Drive. Day 8 - The strategy for this day is pretty interesting. I start the day with 40 Blue Pikmin, the minimum required to get the Anti-Dioxin Filter out of the water. After I do that, I need 15 Yellow Pikmin to get the Libra down from the cliff, but since I only have 9, I need to turn 6 blues into yellows. After I get the Libra down, and the Analog Computer out of the water, I turn all my Pikmin, except one yellow and one blue, into reds, because I need to carry a few parts through fire on this day. This day, unfortunately, had one of the biggest mistakes in the run. Carrying back the (part), some Pikmin got burned by a Firey Blowhog, and it took a while to recover from that. Day 9 - The final day. In this run, this is the only area that is completed in a single day. Since I don't have very many Blue Pikmin, I need to make my Red Pikmin swim across the water to build the first bridge. The boss fight could have gone a bit better; ideally I would have killed him in the second cycle. Luckily, I killed him really quickly after the second cycle, though. I was probably a few frames away from losing half my army!